Quilts. Webster's dictionary defines them as "a bed cover with stitched designs that is made of two layers of cloth filled with wool, cotton, or soft feathers". The first use of the term 'quilt' is credited to the year 1555. 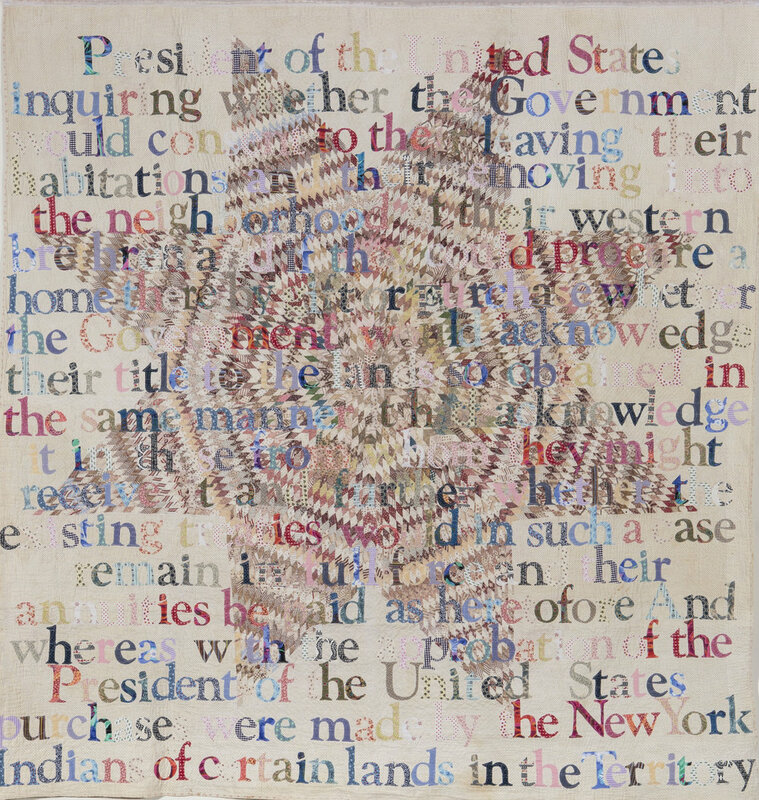 But for the Native people of this country, my people, the quilt and what it represents transcends modern time keeping. 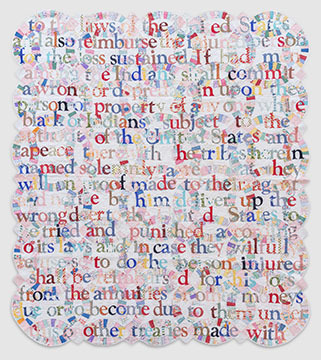 Yet, my quilt project has everything to do with particular, painful moments in so-called modern time: when 'white man' broke his promise over and over again to the originals settlers and people of America: Native Americans. 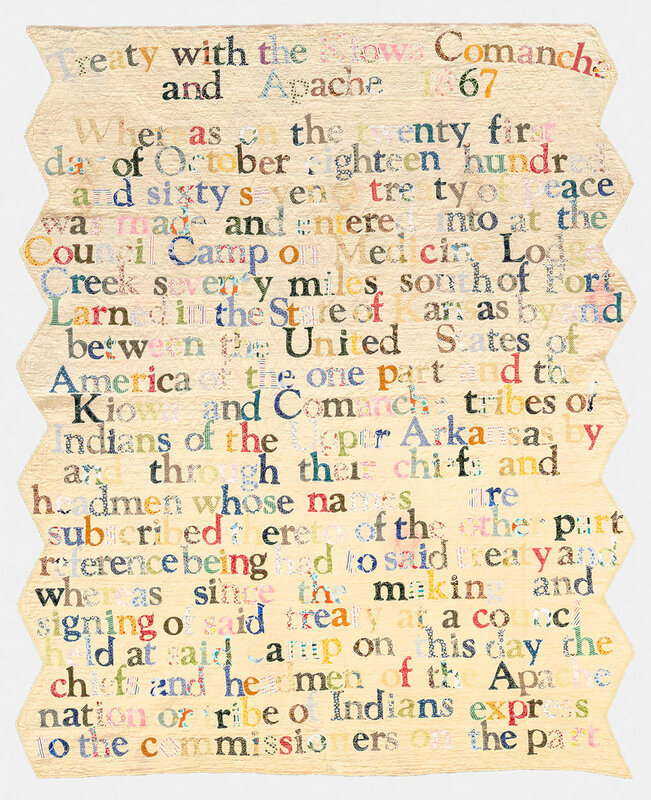 I have been cutting out the letters of entire Broken treaties--these were pacts written by the United States Government and signed by Native American Tribes. These pacts promised the tribes money and power in exchange for the rich land they called home for possibly thousands of years. The Government took the land; however the Tribes were left penniless. I have chosen to use Calico Fabric as it was the first industrialized commodity that was made in the United States and then exported to Europe. This fabric made many white men very wealthy. 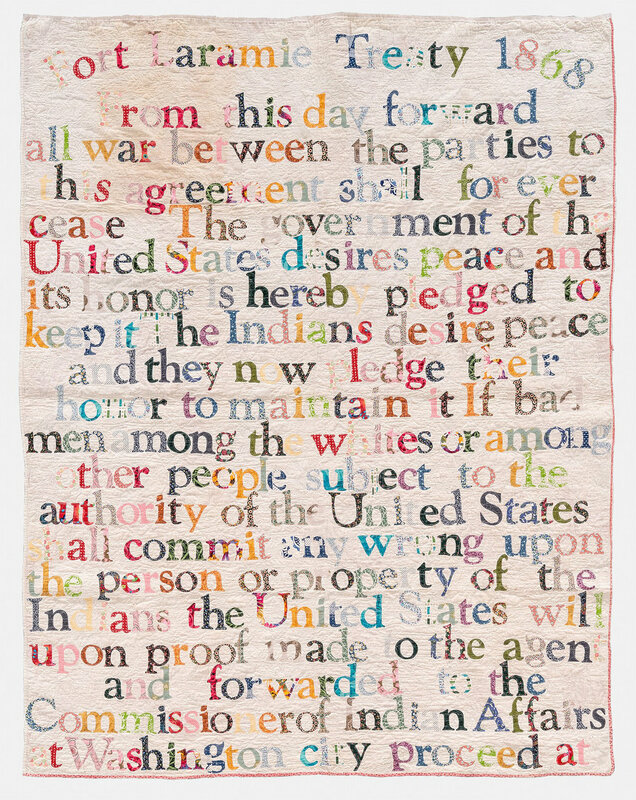 I have chosen to place the broken treaty onto antique quilts that are roughly the same age, and appear worn and broken. In fact, they could have been made at the same time the treaties were drawn up and signed. 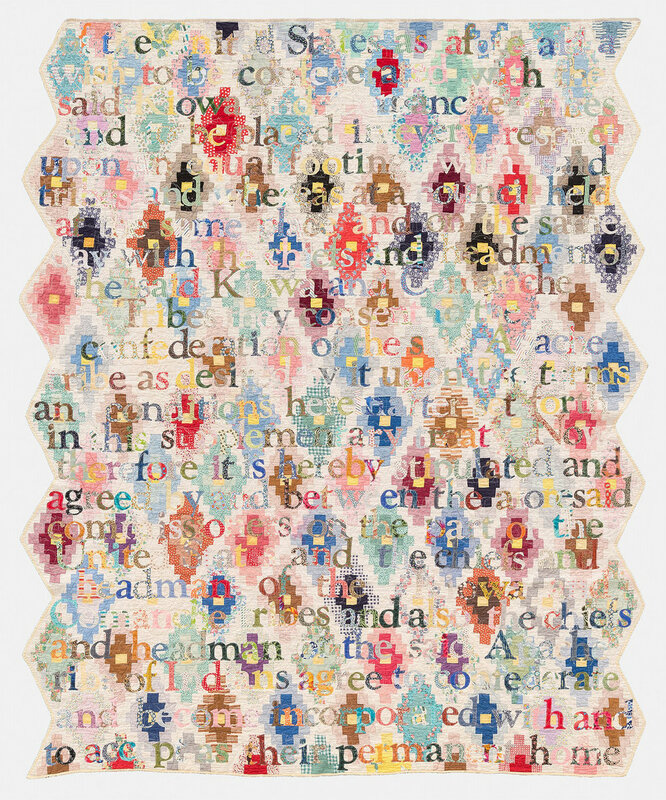 Quilting is thoroughly American; the quilt and quilting bees symbolize community and the promise to work together as a group to finish an major endeavor. 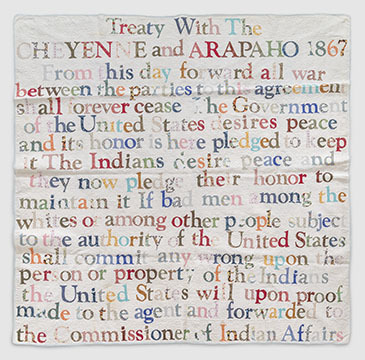 While it is difficult to know for certain who made the original quilts in the project, there is reason to believe they'd been thrown out due to their worn appearance. In my view, not unlike the Native people. Sewing together injustice with an object of comfort stirs deep emotion. For I, as all people of Native American descent, have carried around a heart-wrenching history, a burden and a loss. Now I choose to weave that over-arching sadness into a source of tremendous comfort. I am taking the burden of the broken treaty placing it on top of the work of the original Colonists. 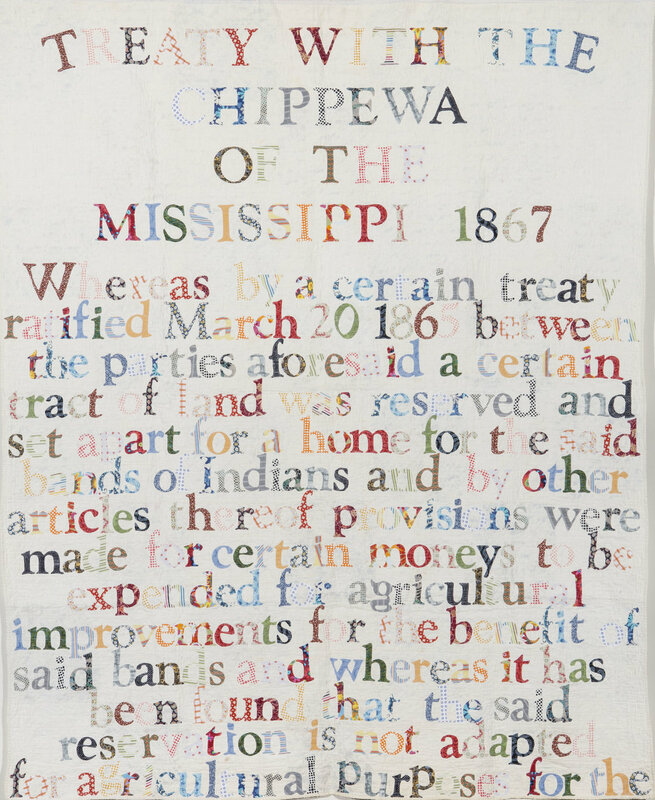 Putting the words of the Broken Treaty on quilt subjects the Colonists to the truth; and forces them to experience their own unhooked treaties. This is my truth; I sew the words, powerful speech, for my people, for my family, and for myself. It is an act of giving back the misuse and abuse of power. 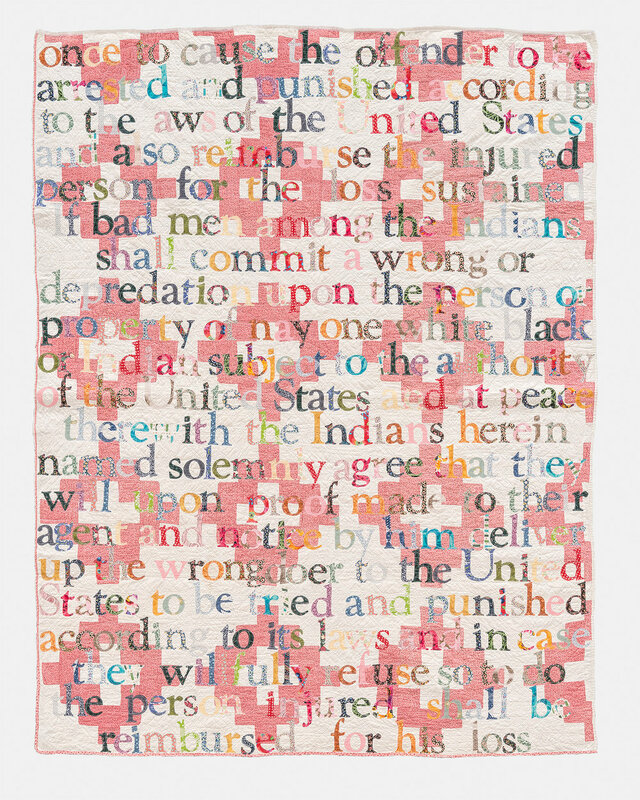 My greatest hope is that this quilt inspires a movement of healing and prosperity. There is no room for broken treaties.